Rodrigo Alvarez aka Rainforest is our brother based in Mexico..he's not new to Movementinsound and has had several very well received EP's via our drum n bass label Cadence. 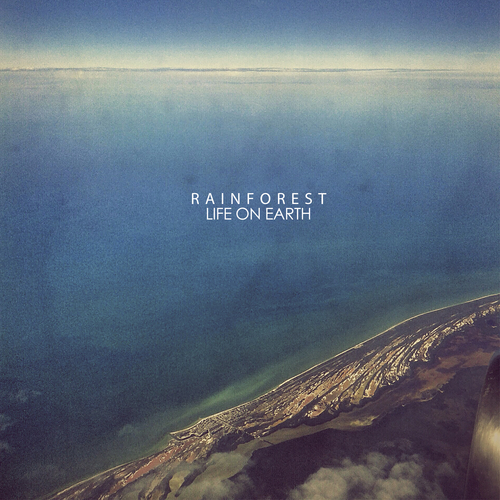 This time Rainforest returns to true to form with his new album " Life on Earth'. An album of electronic expression..seamlessly moving through the genres downtempo , dub , breaks and artcore inspired golden era drum & bass. PREORDER the CD which is limited and get the Digital release free on release day as a bonus gift! We advise you to move quick though as CD's are limited and only available exclusively via our store. ‘Black Ocean’ switches into full on classic intelligent Jungle mode a la PFM, Bukem et al. ‘Coyoaca╠ün’ swims in the direction of Detroit for a futuristic minimal sound wall. ‘Earth From Above’ dives deep into the coral reef combining subtle synths with a deep throbbing bassline, light meets dark but more sophisticated than that simple metaphor. ‘Garden Of Souls Pt 1′ treads a line between mellow and slightly sinister while Pt II slips into some intricate organic instrumentation and drumfunk style breaks. We get jazzy and downtempo with ‘Hostel Alley’ before sailing to the Middle East for the melancholic haze of ‘Lyla & Saleem’. Unfortunately at this time we can't offer all the Rainforest - Life on Earth tracks as individual wavs, as some of these tracks exceed the shops maximum (9mins) download length.